When auto glass damage happens during an accident, the first instinct that many drivers have is to call a towing company to take their car or truck to a repair facility. This practice would be routine for auto body damage, but not for window damage. PG Pacoima auto glass repair specialists are qualified to repair window damage on every type of car and truck. Glass damage can happen anywhere and at anytime. Trying to find after hours repair is a challenge. Since you cannot drive with damage, finding auto glass repair in Pacoima is a high priority. PG Auto Glass is the leader in local repair and restoration of automobile glass. Severe damage to your automobile windows cannot be fixed using traditional repair methods. The glass needs to be replaced with high quality glass that is certified as safe by your automaker. PG Pacoima auto glass repair specialists arrive in mobile response vehicles and strictly use OE glass for every replacement. This guarantees no defects or installation errors that can be common with cheaper glass. City buses, work trucks and delivery vehicles all depend on complete functionality of the installed safety glass. A disruption caused by an accident will affect more than the driver of the commercial vehicle. 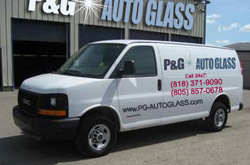 PG auto glass repair in Pacoima specialists arrive within a short time period to complete a window replacement. Unexpected weather can turn into a large problem when your car or truck windows are damaged. Strong winds can blow debris or falling branches can easily break the windows on your automobile. Not all Pacoima auto glass replacement companies provide emergency service or certified technicians. It takes years of experience and excellent work to build a reputation for complete customer satisfaction. Local residents select PG Auto Glass for auto glass replacement in Pacoima for the fast service, friendly specialists and earned reputation for quality. Do you need emergency auto glass repair or replacement in Pacoima, CA in zip codes 91331, 91333 or 91334? Contact PG Auto Glass and our technicians will be on their way as soon as possible.